Ibn Battutta speaks as a young man. But to speak these words to us now, the great traveller needs the crutch of Ben Kingsly’s assertive voice. We hear the Academy won actor giving voice-over and, thereby, credence to Ibn Battutta. 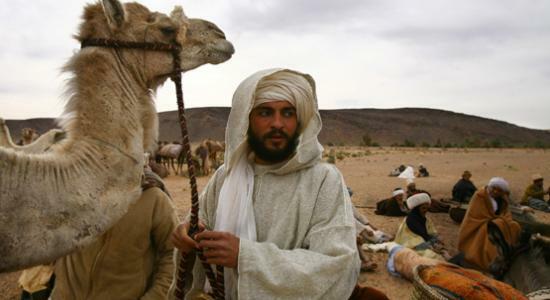 The context is top-rated film Journey to Mecca: In the Footsteps of Ibn Battutta directed by Bruce Neibur. And we feel assured and Ibn Battutta is baptised in the hallowed princints of Hollywood: the largest standing symbol of commercialised mass culture. We may be reluctant to accept the screen version of Ibn Battutta, not because of the below par acting of Chems-Eddine Zinounce, but because of our doubt and concern over anglicanising Ibn Battutta (who speaks English in the film!). The question remains: has Ibn Battutta ever spoken himself out? Or, to put in other words: has our commercialised mass culture ever allowed him to speak himself out? Abu Inan Faris (1348-58), the reigning Marinid Sultan of Morocco, realised that Ibn Battutta can be sold like a hot cake in the market. When the sultan commissioned Muhammad Ibn Juzayy, poet, theologian and legal expert, to collaborate with Ibn Battutta to compile the latter’s travel experiences, the sultan advised Juzayy in no uncertain words: “the compilation should ‘comprehend what was of profit in them…giving care to the pruning and polishing of its language and applying himself to its clarification and adaptation to the taste of readers, that they may find enjoyment in these curiosities and that the profit to be derived from their pearls should be increased in stripping them from their shell.” (David Waines, The Odyssey of Ibn Battuta: Uncommon Tales of a Medieval Adventurer). The thrust of the consciousness that Ibn Battutta’s words should not remain unrecorded is ‘the profit to be derived from their pearls’ and ‘the enjoyment’ that ‘the readers may find in these curiosities.’ It is as if Sultan Faris, as befitting a publishing tycoon like Rupert Murdoch, was giving a remarkable tip to his favourite editor: on the necessity of maximising profit and of piquing readers’ curiosities by pruning and polishing document. Ibn Juzayy was not Ibn Battutta’s alter ego, as he is expected to be; he was his editor. Ibn Juzayy was not supposed to serve Ibn Battutta by dictating what the traveller pulls together from his memory; he was supposed to serve the sultan, his publisher, by sorting the wheat of profit from the chaff of Ibn Battutta’s memories. Today we know editing is not a nobler job than doing the item dance (a post-modern Indian version of belly dance) for a thriller. It’s appropriating texts, pruning them, polishing them, and packaging them for those who have enough stuff in their purse. In the final analysis, we don’t hear Ibn Battutta speak. We hear Ibn Juzayy and Ben Kingsly speak. That is the requirement of mass culture; we can’t help it. But this is not the destiny cut out for Ibn Battutta alone. We did not allow Marco Polo, whose year of death in 1324 saw the birth of Ibn Battutta’s hunger for the roads to Mecca, to speak himself out. David Weines in his book quoted above informs us that Rustichello of Pisa was Marco Polo’s compiler, or his editor, to use the apt word. What Waines quotes as having been said by Ibn Battutta can’t be taken for granted, since the requirement of mass production of his travel accounts ever since the first commissioning has been based on profit and readership. Also, Waine’s (?) account of a gourmet Ibn Battutta clashes with Ibn Battutta he presents on another occasion as a man of zhud (asceticism): Ibn Battuta in fact had acquired considerable spiritual capital during the first four years of his travels. He had performed three pilgrimages to Mecca and had sojourned in the Holy City for about three years. Further capital was accumulated in these years by his attitude towards zuhd, the act of renunciation by ascetics. A God-conscious piety fostered zuhd not in the medieval Christian sense of extreme repudiation of the flesh but rather in a disdain for material comfort. We are far removed from Ibn Battutta. That is why we can’t see him as clearly as he might have seen lands and people.